The mermaid to entertain the 80th birthday party for my timeless girl, Betsy, was already booked so we had to improvise. The mermaid apparently swims in pools where the parties are being given and “entertains” the crowd. People, I am not making this up. And, I also didn’t ask what “entertains” means. I was hoping for Bette Midler’s Mermaid, but I don’t think that was it. The recession apparently has not yet hit Osterville on Cape Cod because the mermaid was swimming or doing whatever she does in several other pools on this particular August evening. 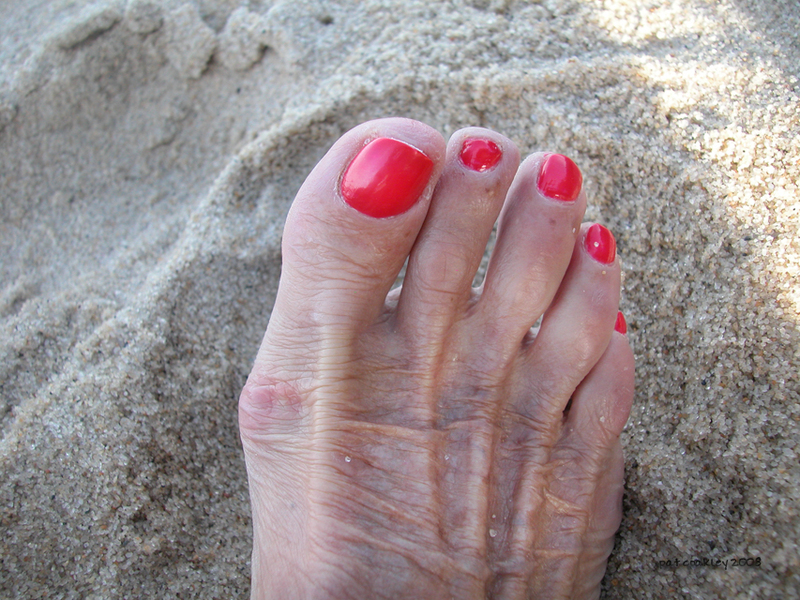 So, we did a little of this–Arts and Crafts with acrylic paints, and a little of that–family trivia questions–and tossed in a few words about the birthday girl’s amazingly beautiful timeless toes to fill the aquatic talent gap. What every blue stater knows: you don’t need mermaids to have a good time. Plus, I smelled particularly herbaceous because my cousin gave me a new fancy bottle of perfume: Mark Jacobs, Basil. I didn’t have the heart to tell her that I grow basil out back for free and have plenty of it. But, it is true–I have never before used it behind my ears. Single for a Reason, Eau de Mole. I’ve got one of those out back, too. That’s a scandalous foot! Who needs a rent-a-mermaid when the birthday gal is siren enough. Sheesh, Pat, a Chanel wallet, Marc Jacobs perfume, I think Nathalie would be proud. Mermaids-4-Hire? I’ve never heard anything like it. That’s why I love your blog. Also, that pedicure is so perfect that it needs referrals and an 0-800 number. “Mark Jacobs, Basil” Please do not, and I repeat do not, let our health minister hear of this perfume!!! In Cape Town that would have a whole new meaning. Yes, indeed, the birthday girl was and still is siren enough, BL! Plus, she has wallpaper to die for. Which may be my next blog! Epicurienne, this mermaid for hire was a first for me, too! But, apparently, I just don’t get out enough and cross over to the red state part of our blue state. Some very strange things are going on there! Sanity, Like all things, a little of this scent goes a long way. Yesterday I was followed by every insect in the neighborhood. I don’t think my eau de mole will attract as many living things, do you? Hilarious, Tysdaddy…I’ve not gotten close enough for a whiff, but I’m not tempted either. Now, how in hell are you finding this post a year and half after it was first posted!! You kill me. Seriously, you are as your Dad would say of me, “a beauty”. Fingers crossed about this weekend’s weather! Cuz Mary arrives on Friday afternoon.